Dr. Brown uses low level laser therapy extensively in practice. 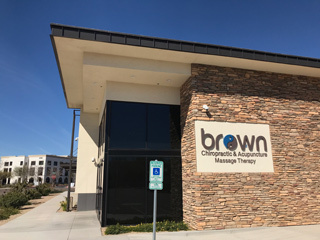 While laser therapy is available in other Chiropractic and Medical offices, Dr. Brown combines the laser with Acupuncture to do a unique form of Laser Acupuncture. Laser stimulation of Acupuncture needles provides all the benefits of low level laser therapy and increases the effect of the Acupuncture treatment. Laser Acupuncture is effective for reduction of pain, swelling and muscle spasm, and speeds the healing of acute and chronic musculoskeletal conditions and injuries. The Erchonia FX635 laser which Dr. Brown uses is especially effective for the treatment of plantar fasciitis. It was specifically developed for use with plantar fasciitis by Dr. Kerry Zang, a Podiatrist who is a colleague of Dr. Brown. The Erchonia FX635 is a “cold” laser which produces no heat or discomfort during the treatment. Erchonia has been a world leader in low level laser technology since 1996. You can find more information about Erchonia at their website: www.erchonia.com.